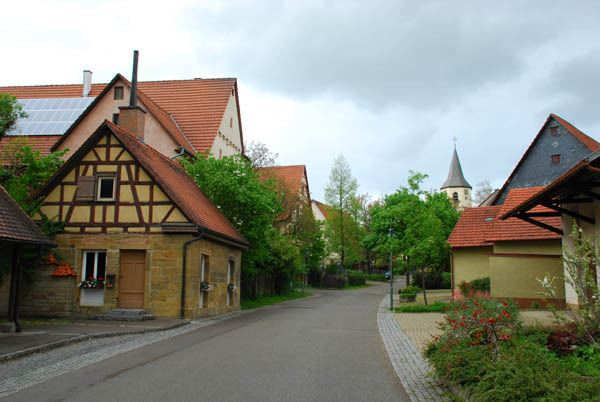 We are on the trail of ancestors with genealogist Margie Weiler in the area around Goeppingen, Baden-Wuerttemberg, Germany. One of the highlights of Sunday was a visit to the hilltop hamlet of Oberwaelden. 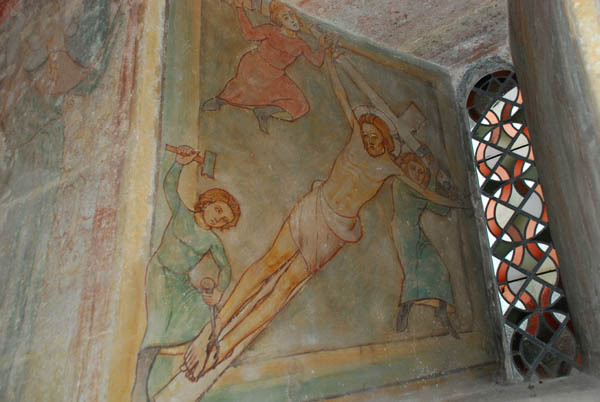 The church there, St. Nikolaus (built pre-Reformation in the early 1400s) is brilliantly decorated with paintings in its ancient tower, which is even older than the rest of the church building. 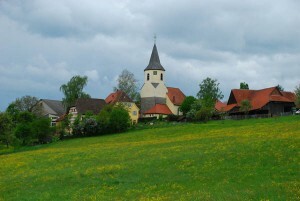 The tower, known in German as a “Wehrturm,” was used for observation and also as a last point of refuge for villagers who felt threatened during a time when every neighbor wanted what every other neighbor had. Built at a time of strife between descendants of the ruling Staufer dynasty, the church tower could be as old as the late 12th century. Documents show that the tower as seen today dates back to about 1284. 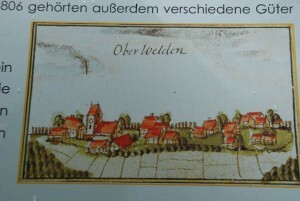 The village called “superiori villa Waldiu” became “obere Dorf Waelden” as part of the extensive holdings of the nearby monastery at Adelberg, which through a trade between Kaiser Friedrich I Barbarossa and Herzog (Duke) Welf VI. Precious paintings such as what survive in this church can thank their state of preservation to the Protestant Reformation and what followed. Hundreds of frescoes all around this area were whitewashed over, as the strict teachings of Martin Luther pointed out that the word, and not symbols, were the most important part of being devout. 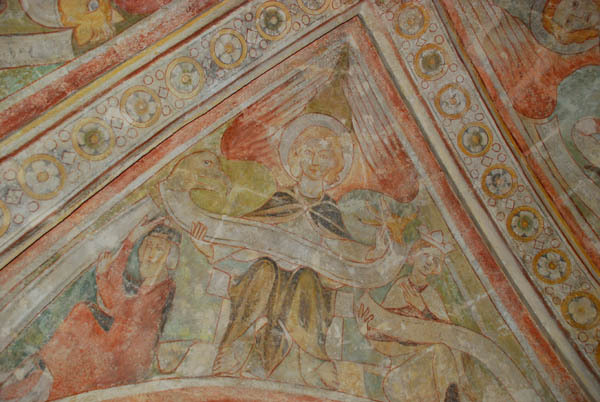 Thanks to being whitewashed, the paintings survived. Painstaking and modern restoration methods have brought these beauties back to life. 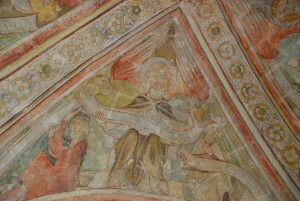 The paintings show scenes from the Bible plus representations of the Four Evangelists, Matthew, Mark, Luke and John. 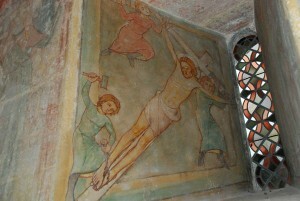 Painted deep within the niche on either side of the narrow choir window, facing east of course, is a vivid depiction of Christ being nailed to the cross. The entire area is lit by spotlights thoughtfully installed by the parish, which has its main office in a nearby village. A sign on the exterior of the church tells the visitor where to go to find a key. Of course, the ability to read German is vital, as all of the directions are in German. The rest of the historic village has plenty of 300 and 400 year-old barns and houses plus a bonus – the village bake house, still in use, right next to the bus stop. It’s common in this area for village women to get together from time to time and bake the round loaves of “Bauernbrot,” (Farmer’s Bread) together on weekends. If one is lucky enough to pass through on one of those days, a hunk of this bread, still warm, with “schmaltz,” or lard with onions and apples is a delight that cannot be easily captured on a blog. 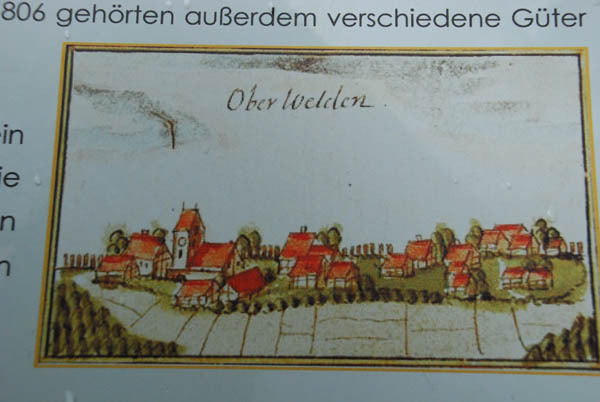 Posted in Family History Tours and tagged adelberg, church, nikolaus, oberwaelden, oberwalden, paintings.